Inky Paws Challenge: Inky Paws Challenge #4 Winners! Inky Paws Challenge #4 Winners! 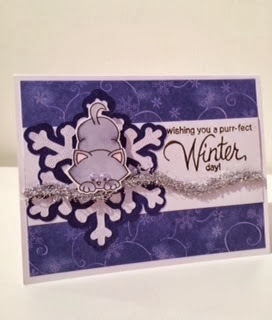 We had so much fun checking out all the entries for our Fourth Inky Paws Challenge at here at the Newton's Nook Designs blog. I have to say, this was a tough one. We had so many entries this time! I want all of you who entered to know I get excited every time I receive an e-mail that someone has uploaded a new entry! Even if I'm not at home to check it out and comment right away, it always makes me happy to know someone is creating with our stamps! This card by Indy is our first winner this month! She really made that sketch look amazing! Indy submitted a couple of cards but what stood out on this card was was how she created a cute little scene in the circle using Newton's Holiday Mischief! The sparkly tree is so pretty & we loved her color palette of blue and silver! 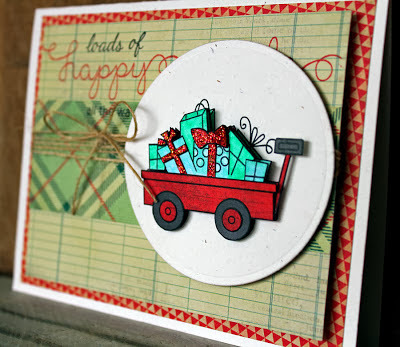 Our second winner is Larissa Heskett with this fun wagon card. We loved how she combined the Wagon of Wishes set with the words from the Holiday Wishes set. Plus, it's so cute how she added sparkle to those gifts in the wagon and switched up the wagon handle so it's sitting up instead of lying down! Congrats Larissa and Indy! Don't forget to send me an e-mail at info@newtonsnookdesigns.com to claim your $10 store credit and get your winner badge for your blog! And because there were so many awesome cards - we chose three more as our favorite picks! If you see your card below, contact us to get a "favorite" badge for your blog! 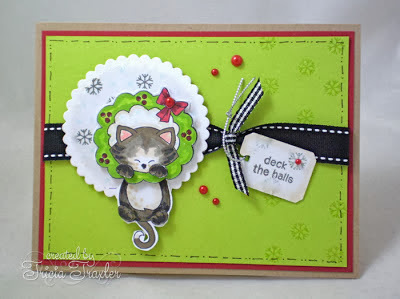 Tricia Traxler created this sweet card with the kitty and the wreath from Newton's Holiday Mischief! We loved the bright green background the the way she colored the kitty! Kimberly Rendino created this adorable Holiday Card without using any Holiday Stamps! So fun how she used the kitty from Newton's Antics and gave him some tinsel to play with. Also love the hand-written "winter". MiamiKel created this bright colored SEAson's Greetings Card - Love those bright colors for the Holidays! Thanks again to everyone who entered - We LOVE seeing all the entries! It's seeing what you create with our stamps that makes all the work we put into our business worthwhile! If you didn't win this time we hope you'll try again next month. It's always SO HARD to pick the winners because everyone does such a great job! We will be doing another challenge starting on November 22nd! Stay tuned --- Starting Tomorrow you can see previews of our two new sets being released at the end of this week! Here's a hint - get out your mittens for some winter fun!